The images below on a personal level, are souvenir odds and ends accrued either purposefully or accidentally when I was a History Diploma student at Ruskin College (1986-88). They have been buried away in lofts, albums and cupboards in the intervening years and only intermittently looked at. I had forgotten about some of them until rediscovering them in a de-cluttering purge very recently. In this personal sense and so arranged, they form part of a visual narrative of myself, of my time as a Ruskin student in the past. I have now, in the present though, to view them as something bigger than myself. 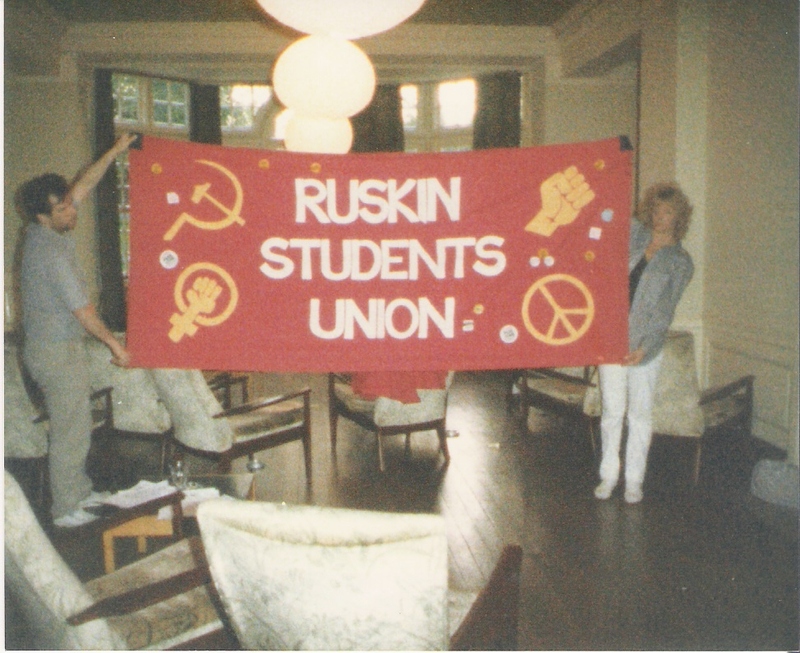 With the destruction of much of the Ruskin student archive, such memorabilia and souvenirs take on a more intense meaning and stand for the College’s history as a whole. Hence a few pieces such as the 1906 postcard and the 1946 Picture Post feature I have pro-actively sought out on eBay for this reason. I would like to think such visual materials help facilitate a more social understanding of student life at Ruskin than a list of names and dates might do, important though those are as a base line, and to which I have also added. It is also a modest initial attempt to recall for the digital age, some of those fellow students of my own cadre that might otherwise go unacknowledged. At least in a small way, a few of the names below can also be matched to an image of the person concerned which affords them a little more substantial presence. It would be good if any other Ruskin readers / viewers were prompted by this to scan their own images or contribute their own memories as a result. Aubrey and Peter were both Labour Studies Diploma students (1986-8). Aubrey was a member of Ollerton branch (Nottinghamshire) National Union of Mineworkers (NUM). Peter was a member of the Post Office Engineering Union (POEU). After Ruskin, Peter stood as a Labour counsellor for Telscombe Cliffs in Brighton. The third person pictured in the background was called Mark who was a member of the National Graphical Association (NGA). He was also one of the two youngest students at Ruskin at that time at 20. The woman pictured was named Colette. She was a Ruskin student c.1987-88 though I’m not sure what course she was on, possibly Labour Studies. The banner dates from c.1987. It is being displayed in the student common room at Ruskin Hall, Headington. The banner dates from c.1987. It is being displayed in the student common room at Ruskin Hall, Headington. On the left is Alex Pandolfo a Labour Studies Diploma (1986-8) student and John O’Reilly (1986-8) an English Literature Diploma student. John went to St Johns College, Oxford after Ruskin to study PPE I believe. 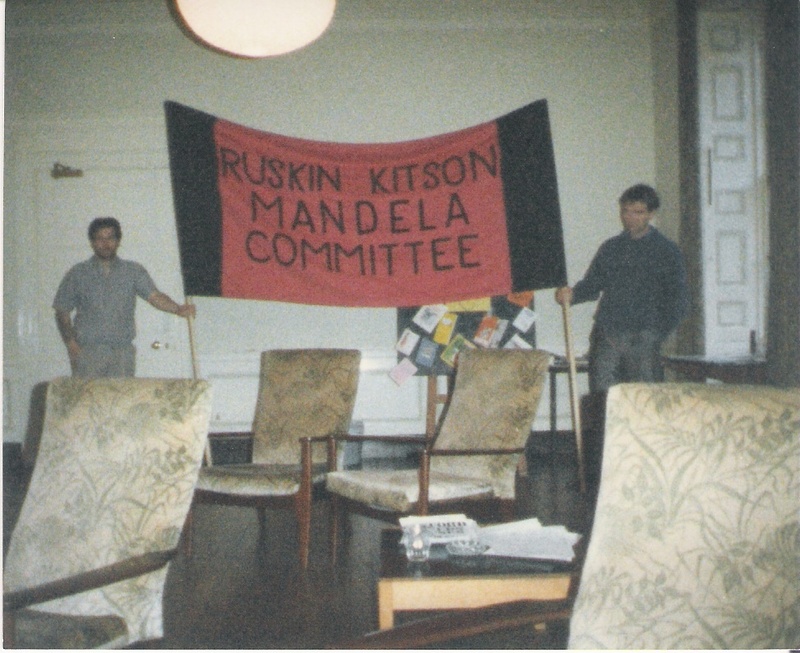 We picketed the Shell petrol station in Headington and the South African embassy in London with this banner as part of the anti-apartheid campaign. Again dating from 1987, the RSU banner is being displayed in the Ruskin Hall student common room by Alex Pandolfo and Pat Hunter who was from South Yorkshire and was a member of the former National Union of Tailors and Garment Workers (NUTGW). She was also a Labour Studies Diploma student. 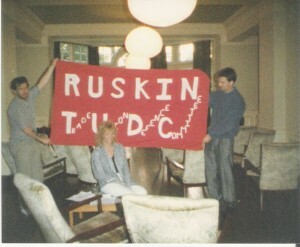 Again from 1987 in the common room at Ruskin Hall with Alex, Pat and John. The idea of a year badge was taken up by the following year’s student intake. The October 1988 intake were also the first year that the one year Diploma course was introduced. The design is based on a suggestion by Paul Martin to the incoming TUDC committee chair. There a number of students who I was at Ruskin with whom I can see in my mind’s eye but cannot recall full names or find any details of. I am mentioning them here as partial contribution to a hopefully fuller restitution later on. Tony from the black country who did history for a while but changed courses (I think to sociology). Dave from Durham (another very young student) also Dip Labour Studies. Elvera, a nurse from London, social work Diploma student. Charley – Social Work Diploma, who was refused enrolment at the Bodleian Library for forgetting some aspect of documentation. This ensued in a loud choral humming of the ‘Red Flag’ by the rest of us as he marched out muttering about it only representing hundreds of years of class oppression anyway! Roy – NUM Silverdale (Staffs) Dip Labour Studies. Craig Brody – Dip History. Craig was my study partner as students were assigned the same essay topic in pairs. He was from Manchester (or the wider area thereof) and quite an intense sort of person. Dave Berry – Dip. Eng. Lit. Dave was another young student. He subsequently successfully undertook a BA Eng Lit at Sussex University and a PGCE in Cambridge. He then undertook VSO work as a teacher and subsequently returned to become Deputy head at a primary school in the South-West where he came from. John O’Reilly – Dip Eng. Lit. He went to St Johns College, Oxford to study for a BA in PPE. Mark, another young (c.20 years old) student and an NGA member doing the Dip Labour Studies. Martin – a member of the Post Office Engineering Union who took voluntary redundancy from British Telecom. He did the Dip Labour Studies. He took a BA in Law at Sussex University and subsequently was employed by the International Federation of Transport Workers in London in their legal team. Pat Hunter – Dip Labour Studies. From South Yorkshire where she had worked in a garment factory and was active in the Women Against Pit Closures movement. I believe her project was on London bus workers. Peter Anscombe – a member of the Post Office Engineering Union. He was a Dip Labour Studies student. On completion he was accepted on the MA Industrial Relations at Keele University. He subsequently ran a café for a while and was also in management at Lloyds Bank. Came across the article on RCSU purely by accident and even more so your name. How are you? Been years since our last meeting. Can’t recall if it was at the Willenhall Lock & Metal Wrks office or more likely Manchester. Assuming you are still with the hobby of collecting and wondered if any of the two badges illustrated were still available for sale/swop. So many of the old faces have now gone and a new generation of collectors are now following on however appear to be more Ebay based as opposed to getting out there and actually making contact with people. I suppose you could say at least collecting of TU material is still going on just a different format. Anyway I do hope that you are in good health and it would be great to hear from you at some point. Hi Bernie, My old grey matter is not as good at instant recall as it once was but I expect we met at Manchester. Glad you found this website. I’m no longer collecting TU badges, though I wrote a book on them! 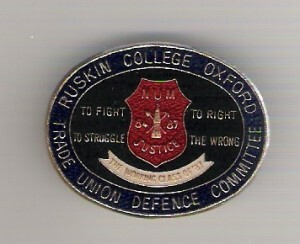 The Ruskin badges pictured are my only copies I’m afraid. Sorry not to have replied sooner as I have just found this reply as we speak. I expected a reply via email albeit sometime ago and it was just by luck that i visited the “newruskinarchives website”. Yes I have the book and read with interest. Sorry to learn that you do not collect anymore although not surprising as many of the old hands are no longer with us,added to that the nature of collecting has changed significantly. If you do come across any of the badges mentioned please keep me in mind. I hope this email finds you in the best of health. Thanks Bernie, I will. I hope you are well also. No doubt much water has flowed under the arches of Magdalen Bridge, since we stood, shoulder to shoulder, outside Headley Road Esso Garage protesting against the incarceration of Nelson Mandela – fond memories never forgotten. Inspired after reading Ephemera, I too have been poking around my loft. Down came a tatty dusty cardboard box labelled ‘Ruskin’. And it appears I have kept everything on paper from those wonderful years 1986 -88 (including my long forgotten Ruskin College T/Shirt – that still fits by the way). If there is any way my time-capsule can be of further assistance do please let me know. I trust you had an illustrious career in social work. Of course, I remember you! Thanks for looking in your loft, it’s great to have all the names if not any images from our cohort. I do recall Dave Barry (literature) taking lots of photos in the last days of our time at Ruskin, I’d love to see them if he ever reads this! I think he became a primary head teacher somewhere but that was decades ago. Nice to hear from you anyway Tony and thanks for posting. I was part of the Black country contingent in late 80’s who all came via Bilston Community college and Wolverhampton SE CLP. They included Graham Jackson, Steve Jones and Pete Robinson. Great to read. 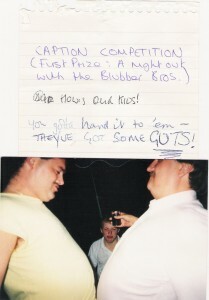 Still reckon I was, with Andy ?, the youngest of our intake at 20. Have loads of photos to bore you all with – just give the order and I will upload. I have an extensive Trade Union enamel badge collection put together over a period of forty years. The badge collection is used for exhibition purposes in an attempt to show visually the developments of our great movement. 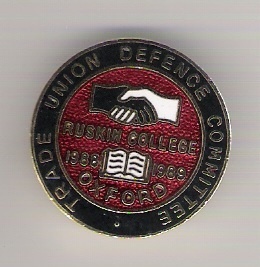 I would dearly like to include any examples of badges issued by Ruskin College Defence Committee to the collection. So if anyone out there could help I would be pleased to hear from them. Hi Tony, you left out Alan Parks from the literature set. Alan had a terrible accident when he got hit by a motorbike while walking. It happened a few years after Ruskin. He made a slow recovery but survived against the odds. I came across this page after reading about Alex Pandolfo in the Daily Mail (don’t worry, I just keep an eye on the enemy). Hope you’re well. I may write again when I have more time. I’ve been teaching for 25 years, and now work at a uni in Central Europe. A couple of days ago I posted something on here. It was up awaiting moderation but then disappeared. What’s going on? Sorry, a volunteer is ill and site administration is sporadic, your post has been approved. What happened to Alan Parks after the accident? Did he go on to study somewhere? Good bloke, fit as butchers dog whilst at Ruskin. He once showed off his climbing skills up a stone wall in Headington -quite impressive really after a gallon of lager and a Kebab. Dave Barry, how about those photos?